Note: A full-scale pdf file of the reconstruction of the Preston survey can be found here. A number of sketch plans of Preston and Lancaster and strip plans of Lancashire roads were deposited at Lancashire Record Office in 1952 and loosely attributed to the Lancashire antiquarian Richard Kuerden. They are catalogued at DDX194 and consist of 54 separate items: DDX194/1 to DDX194/54. Sketch plans of the streets of Preston dated 1684: DDX194/1-8, 10 and 19 (DDX194/19 is catalogued as a plan of Lancaster and is marked as undated). Certain roads outside the towns indicated in outline showing distances and road junctions etc. Sketches of the streets of the two towns, the approximate boundaries of the premises and the names of the occupiers or perhaps the owners. Field sheets of a survey giving the necessary measurements and angles from which plans of the towns could be prepared. All the measurements were in links of 7.92 inches. Some years ago, Stephen Sartin transposed the names from the sketch plans of Preston to the full plan (DDX194/9) and labelled the composite, ‘Map of Preston circa 1690’. A photocopy of this document is in a map drawer at the Harris Reference Library, Preston. The provenance of the documents prior to their discovery at Townley Hall is unknown. Their purpose is similarly unknown, as is the identity of whoever commissioned the survey and who carried it out. On their discovery, they were loosely described as ‘Kuerden maps’, attributing them to the Preston antiquarian Richard Kuerden, possibly on the basis of his producing a topographical guide to the town at about the same time. The guide, which, to judge from internal evidence, was produced a few years after the survey, makes no mention of the survey. No other evidence has been produced to substantiate the Kuerden attribution for the survey.. This examination will follow the practical path chosen by Docton. The key to unlocking the documents would seem to be to attempt to follow the steps taken by the 17th-century surveyors and use local knowledge to consider the wealth of information their surveys contain. Docton produced a plan of Lancaster by following in the steps of the original surveyors as they charted the town with their measuring chain and theodolite. Unfortunately, in his published accounts of his work, he did not record the steps he himself took; space restrictions at that time would have restricted the amount of information he could include in his accounts. The intention here is to follow Docton in an examination of the plans in DDX194 that relate to the Preston area and to include a detailed documentation of that process. Field sheets with sight lines and the measurements and angles from which a plan of Preston could be produced, some of which also include the names of owners or occupiers of properties and the widths of the street frontage of those properties (DDX194/1 front and back, DDX194/3 front and back, DDX194/4 front and back, DDX194/8, DDX194/10 and DDX194/19). Sketches of the streets of Preston giving the measurements of the street frontages of properties in chain links and the names of the owners or occupiers of those properties (DDX194/2, DDX194/5 front and back, DDX194/6 front and back and DDx194/7 front and back). These do not contain the surveyor’s sight lines or angles and seem to cover the most densely populated areas of the town. They appear to have followed on the production of the field sheets. Some of the measurements differ slightly from those on the field sheets, possibly representing a later correction. These plans can be dated from internal evidence. On DDX194/1 Mayor Kellett is linked to a property on Church Street. Kellett was mayor from October 1684 until October 1685. Also a torn corner of DDX194/8 bears the inscription ‘arch ye 25th’, which, taken with the Kellett mayoralty, suggests a date for the survey of around 25 March 1685. DDX194/9 is a plan of the whole town based on the measurements on the above sheets, but whether it was prepared by the original surveyors or by a later hand is unknown. It has been suggested that cross hatching on the plan is not usually found until the 19th century. DDX194/9 also includes detailed depictions of individual buildings in the town together with plot boundaries, information which is not contained on the above sheets. The source and accuracy of this additional detail is not known. Items DDX194/22, 23, 28, 29, 38, 39 and 44 are strip plans of the roads around Preston. The first four sheets seem to be the work of one surveyor: the style is the same, as is the handwriting, which also seems to match that on DDX194/1-8, 10 and 19. DDX194/38, 39 and 44 are in a different hand and are stylistically different from the others. None of the above sheets is mentioned by any of the historians of the town before their discovery in 1952. These sheets are the working documents of the original surveyor. They were for his own use, not intended to communicate with others. As such, the writing is often little better than a scribble, corrected and erased in places. Parts of the sheets have faded and are virtually indecipherable, edges of some sheets appear to have been torn off, and at times the measurements differ between sheets. This reconstruction is thus open to correction and represents a ‘best fit’ based on the information that can be gleaned from the sheets. The surveyor would have begun by measuring out sight lines around the town, together with the angles between them. These can be plotted from the figures contained in the rough sketches, as shown in the figure below. Some of the sketch plans also contain polar co-ordinates that allow the constructed plan to be orientated. The angles measured to plot what is now Marsh Lane seem to be slightly in error. They have been used here as they appear in the documents. Fig 2. A skeleton plan of Preston based on the measurements of distances and angles on the sketch plans in the DDX194 collection at Lancashire Archives. The distances are shown in chain links. There are 100 links to 66 feet (the length of a cricket pitch) and each link measures 7.92 inches. Angles are shown in italics in degrees and minutes. The names of principal streets have been added to aid orientation. Also included are polar co-ordinates found on the sketch plans. Fig 3. A section of sketch plan DDX194/3 showing some of the measurements and angles from which Fig 2 was constructed. The next stage was to plot the streets. This seems to have been done by measuring distances along the sight lines and measuring the perpendicular distances from these to the street frontages to prepare a street plan of the town, as shown in Fig 4 below. Fig 4. A street plan of Preston based on the measurements on the sketch plans in the DDX194 collection at Lancashire Archives. The names of principal streets have been added to aid orientation. With this framework in place the surveyor could then add detail to the street frontages. His concern was simply with the lengths of those frontages; detailed measurements of buildings other than of their street frontage are rarely made. In effect, the sketches yield a sort of exoskeleton of the streets, with little or no information about the spaces behind the property fronts. So the usual caveat applies: absence of evidence is not evidence of absence, and the white spaces on the reconstructed plan could have contained any number of structures. DDX194/9 purports to fill these gaps, but it is uncertain how accurate these infillings are. Four different letters are attached to different properties or spaces on the plans: h, c, b and o. Occupied buildings would seem to be marked by h, unoccupied buildings such as stables and workplaces by c, barns by b (and sometimes c) and enclosed open spaces such as yards and closes by o. Examples can be seen in Fig 5. Only occupied buildings have the name of a person attached to them. These names could represent the owner, owner-occupier or tenant of the building. Some public buildings, such as the town hall and the church, are distinguished as are hostelries, windmills and dye houses. It is unclear whether these additions include all such properties. For example, there are far more hostelries mentioned in the contempory diaries of Thomas Bellingham and Lawrence Rawstorne than appear on the sketch plans. Also, two White Horse inns appear on the plans: one on Fishergate which corresponds with entries in the Bellingham/Rawstorne diaries, and one at the top of Friargate. The height in storeys of some buildings of more than two storeys is indicated, but again it is unclear whether all the other houses in the town were one- and two-storey. The number of chimneys on two properties is shown, as is the occupation of one householder. Fig 5. A section of DDX194/2 illustrates the use of letters to denote property types. Fig 7. 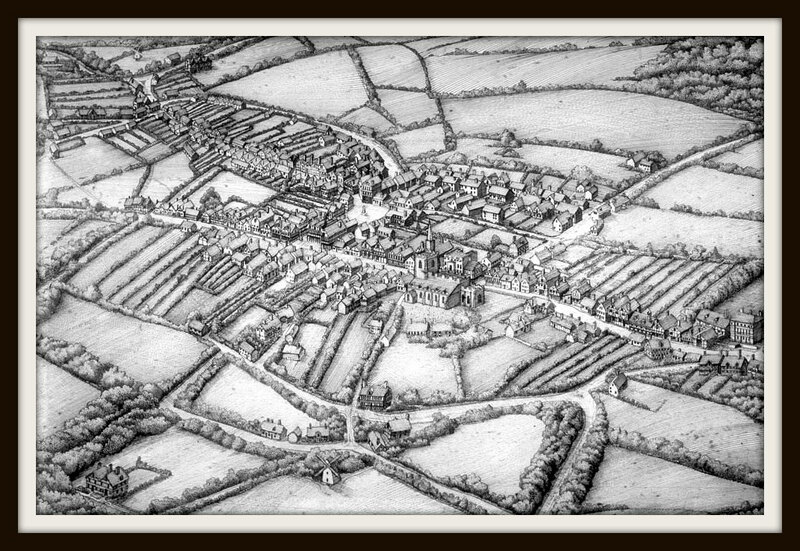 A wonderful artistic visualisation of Preston in the late 17th century by Terry Rushworth. The antiquary Richard Kuerden’s 1685 survey of the roads and boundaries of Cartmel parish was carried out as part of a wider project to map the roads and towns of Lancashire, related to his life’s work studying the history of the county. Rediscovered in 1952, but largely unpublished since, the manuscript maps throw new light not only on the technicalities of late-17th century surveying, but more importantly onto the landscape, people and places of Cartmel, from the first representation of Over-Sands routes, to the earliest date for a bloomery forge on the Winster, to the impact of the Flookburgh fire of 1664, and probably the only surviving representation of Flookburgh chapel. The landscape is seen to be characterised by stone walls, something virtually unknown elsewhere in Lancashire at that date, while some 35 people are named, from Squire Preston of Holker, to Widow Housman, the keeper of a Cartmel lodging house. Bill takes a different position from that argued here, that the plans ‘are clearly not the work of an experienced surveyor’ and that they are probably the work of Kuerden. He deals with the subject more fully in a forthcoming book on Kuerden’s life and work. Kenneth Docton, A Directory of Lancaster, 1684 (Lancaster, 1954): Preface. Kenneth Docton, ‘Lancaster 1684’, Transactions of the Historic Society of Lancashire and Cheshire 109 (1957): 129. R. Kuerden, A Brief Description of the Burrough and Town of Preston, and Its Government: Originally Composed Between the Years 1682 and 1686 … (Wilcockson, 1818), https://books.google.co.uk/books?id=KCAwAAAAYAAJ. William D. Shannon, ‘The Landscape and People of the Cartmel Peninsula in 1685: The Kuerden/Towneley Maps’, Transactions of the Cumberland and Westmorland Antiquarian and Archaeological Society 18 (2018): 201–22.